Sit on a lat-pulldown machine and have a straight-bar attachment positioned at the top. Keep the knee pads suitably placed for your height. Extend your arms over the head to hold the bar, with your palms facing forward and the hands spaced out 3-5 inches apart, which is smaller than the shoulder width. Maintain an arch in the lower back by bringing your torso back and sticking the chest out. It is the starting position. 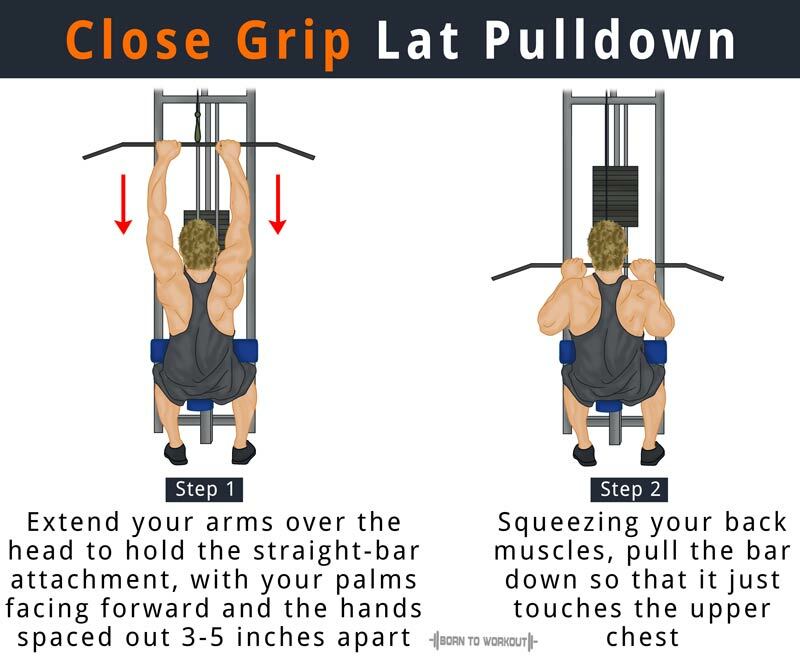 Pull the bar down so that it just touches the upper chest. Squeeze your back muscles after achieving the full contraction. Pause for a second, press your shoulder blades, and then reverse the movement to lift the bar to the initial position. Here, your lats should be fully stretched and arms completely extended. Do the recommended number of reps by repeating the movement. Control the weight all through the movement and do not pull the bar using your forearms. Do not allow your head to stick out as you pull. Sit tall and avoid rounding the upper back.